As Birds of Prey comes to an end, writer Tony Bedard offers a string of done-in-one stories in Club Kids. None of these are earth-shattering, but neither do they discrace the work of Gail Simone that came before (versus, say, after Simone left All-New Atom). Many of these stories are in service of Final Crisis, but in a way the tie between the action/adventure Birds of Prey and the cosmic Final Crisis is so interesting that the unlikeliness can almost be excused. The book's title story, "Club Kids," doesn't come until the last chapter, and it occupies strange ground between Countdown to Final Crisis and Final Crisis itself. Fans of Grant Morrison's Seven Soldiers of Victory will enjoy cameos by the faux-urbanized New Gods found in that story; how the explosive death of Granny Goodness in Club Kids meshes with her differing fate in Death of the New Gods is something I haven't quite worked out yet. However, what we do have here is a story of Birds of Prey Misfit and Black Alice, which starts in medias res like some of the best Chuck Dixon Birds of Prey stories. Misfit and Alice, the Dysfunctional Duo, have quickly outshined the more stodgey Oracle and Huntress as the most interesting Birds of Prey characters, and their bickering, bloody team up is an angsty joy to read. I have a hard time believing Bedard's final revelation about the connection between the two characters, but I trust Bedard at this point to do something good with it. Much of this book, as a matter of fact, deals with the fallout of Death of the New Gods, and it's a strange mix for a book that began as a Batman-family espionauge title. What makes it work is that Simone included late in Birds of Prey fan-favorites like Knockout and Big Barda, and Bedard's stories deal with the fallout of what happens to these characters in that other series. Bedard's Lady Blackhawk/Big Barda story is perhaps a bit too much like Sean McKeever's Lady Blackhawk story in Birds of Prey: Metropolis or Dust, and his Knockout story is as much about the New Gods as Black Canary and Green Arrow's upcoming nuptuals, but I appreciated the general continuity between different areas of the DC Universe. 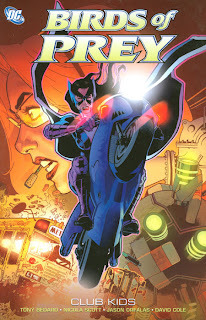 The remaining two stories spotlight Huntres and Oracle respectively; essentially, every main Birds of Prey character gets their own issue in this book. The Huntress story is a fun "what if" tale that considers how other heroes might handle Huntress's case; nothing really happens, but there's great cameos throughout. The Oracle story pits Barbara Gordon against her arch-enemy the Calculator; the idea of Oracle's online worm chomping on Calculator's virus is vaguely ridiculous, but the story has a nice surprise ending. This is indicative of most of the stories in this volume; Bedard doesn't write the most exciting or moving Birds of Prey you've ever read, but these are fine stories if you consider this volume more of a "Tales of the Birds of Prey." Tony Bedard's been making the rounds at DC Comics lately (now regular writer on R.E.B.E.L.S., and I've been impressed with his work on Supergirl and the Legion of Super-Heroes and the Black Canary miniseries. Birds of Prey is coming to an end, that's a fact, and maybe you might've preferred to stop reading with Gail Simone's last volume; but if you're following continuity from Final Crisis or Death of the New Gods, Birds of Prey: Club Kids is an entertaining side-trip along the way. More reviews coming soon -- stay tuned!